Posted on 25. Mar, 2009 by Corey in All, Dayton Dragons Baseball, General Baseball. In the first round of the 2007 MLB First Year Player Draft, the Cincinnati Reds selected High School Catcher Devin Mesoraco 15th overall. Upon signing, Mesoraco was assigned to the Gulf Coast League where he struggled with injuries during the short rookie league schedule. In 2008, 30 games into the minor league season, Mesoraco was promoted to Low-A Dayton, where he was quickly inserted into the Dayton Dragons starting lineup for the rest of the season. Mesoraco is highly touted and ranked very high across the board as a major league prospect. At only 20 years of age, he was invited to Major League Spring Training Camp, where Devin spent a few weeks before being reassigned to minor league camp. Besides being a great kid on and off the field, and having tremendous baseball skills, there is something else about Mesoraco that sticks out to me. He was born and raised in Punxsutawney, Pennsylvania, about 84 miles northeast of Pittsburgh. With only about 6,200 residents living in the town, it is known for one of its town members, Phil. Known as Punxsutawney Phil, this groundhog is a resident of the small Pennsylvania town. Yes, this is the famous site of the yearly tradition of “Groundhog Day.” Each year, on February 2nd, the town holds a ceremony with music, food and a festive atmosphere. Phil, the groundhog, comes out of his home on Gobbler’s Knob and according to tradition, looks for his shadow. If Phil sees his shadow and returns to his hole, the country has six more weeks of winter, but if Phil does not see his shadow, spring will arrive early for that year. During the rest of the calendar year, Phil lives in the town library with his groundhog wife, Phyllis. They are cared for by a select group that wears top hats and tuxedos and on display for all to visit. So besides being a terrific baseball player, Mesoraco hails from a storied town that most may not have heard of. If Mesoraco is fortunate enough to make the major leagues, he will not be the first professional baseball player from his small home town. In 1905, Wilbur Good made his major league debut with the New York Highlanders, on his way to over 2000 career at bats for over six different franchises. In all, six different major leaguers have hailed from Punxsutawney. 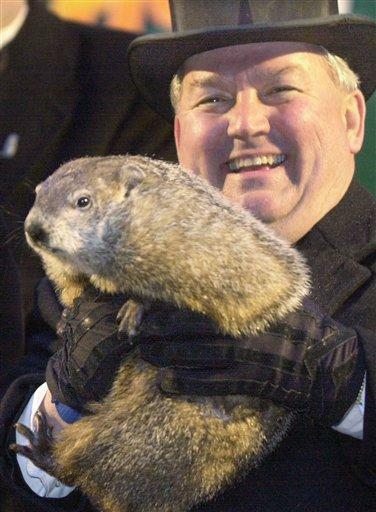 Sad thing is, even a hall of fame athlete from this Pennsylvania town will always been “overshadowed” by Punxsutawney Phil. I bet the reason that guy is so good at baseball is because he had so much time to practice since groundhog day lasts like 100 days every year there, it is kind of cheating. I love that movie. I think you need more sleep! This is funny. When are you coming back to Cincy? henry rodriguez un chico con mucho madero tu en venezuela y no veo comentarios de el ………………….